Martorell, 06/10/2016. – A total of 50 engineers and 40 cars are ready to cover 25,000 kilometres and perform 80 tests in the desert region of southern Spain where daytime temperatures soar to 45°C in the shade. This is extreme summer testing, one of the world’s most demanding performance exams for cars, a genuine boot camp that lasts three weeks. 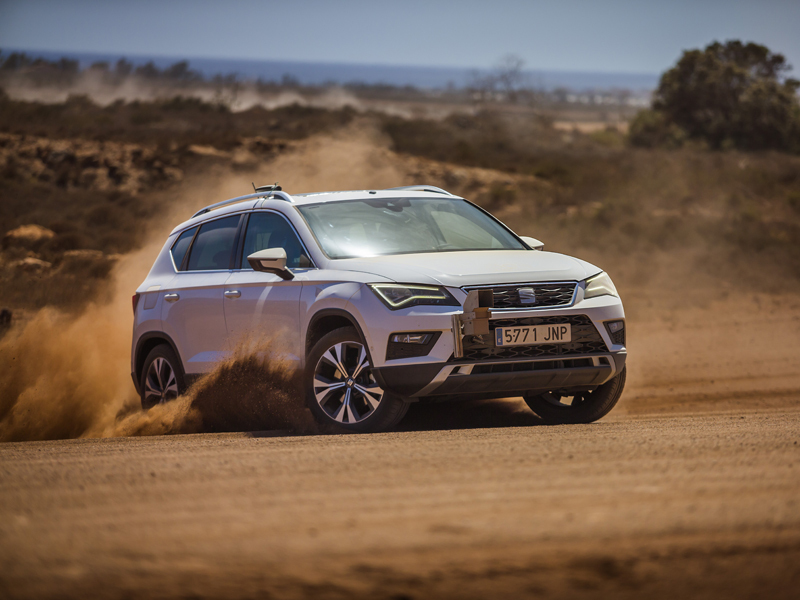 Today it’s the SEAT Ateca’s turn, but what kind of extreme tests are a vehicle put through? Here are some examples. - Traction and controlled descent test. This tests the traction control systems on declines of up to 35% and how the Hill Descent Control performs; this system guarantees a controlled descent without the driver having to activate the brake pedal as well as the automatic enabling of the ABS system where necessary. - Towing control test. There is a greater risk of losing control of a vehicle when pulling a trailer. This test verifies the performance of the Trailer Stability Program, which is a system that helps the car remain stable when it has a hitched trailer. - Klapper test. A typical car has over 3,000 parts. This test ensures that all the components work in perfect harmony and do not cause any irritating noises for the passengers, no matter the type or condition of the surface being driven on. - Dust intake test. A lead car drives through the desert leaving a large dust cloud in its wake, immediately followed by the car being tested to determine the service life of the air filter. - Gravel test. The vehicles are driven 3,000 kilometres on a specific gravel course to analyse the impacts made by gravel on the entire undercarriage, wheel arches and the exterior and under surface of the bumpers. The goal is to ensure all the parts will resist during the vehicle’s service life. With nearly a month of trials and over 80 verifications behind them, the cars have been tested in all their possible configurations so that nothing is left to chance. Thanks to the extreme testing carried out by hundreds of engineers and technicians around the world, drivers can rest assured of being able to drive reliably on any road in the world. Next stop: winter testing.